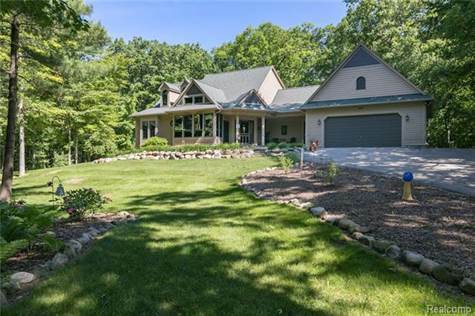 Year Built: 1999 "Updated 2016"
Welcome to your new lakefront retreat, nestled in 6.5 secluded acres of tree-covered wilderness in Oakland Twp. This custom cedar & fieldstone estate provides 233 ft. of frontage on private Lake Tamarack (fishing & beach) and backs to a township park. Access to Lost Lake Trail & local recreation areas--Addison Oaks, Bald Mountain, and more--lie just beyond your front door. This beauty offers soaring windows & lush landscaping with an up-north feel yet lies only minutes from Rochester and Lake Orion. The well-appointed home features new carpet/paint (2018), black stainless steel appliances (2017), water treatment system (2017) & dock (2017). This 3-bed escape-from-the-suburbs will furnish your family with 2 full/2 half baths, hardwood floors, a beautifully-finished walkout basement with a grand wet bar, a spacious 3-car garage and large shed. Outdoors, you’ll gather visitors on the brick paver patio, around an inviting stone fire pit, and under the property’s towering oaks and maples.